I was experimenting with decreasing and increasing and working with a pre-determined number of loops. Net 1 knot in each loop for 1 loop, *net 2 loops together, net 1 knot in each loop for 2 loops*; repeat from * to *. Net 1 knot in each loop for 2 loops, *net 2 loops together, net 1 knot in each loop for 2 loops*; repeat from * to *. Net 2 knots in loop formed by CK, net 3 knots in all other loops. Net 3 knots in each loop. 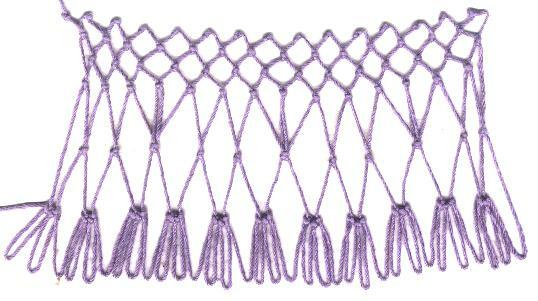 The amount of increase can vary depending on how many knots are net in each loop in round/row 3. Any number greater than 1 will increase the number of loops. 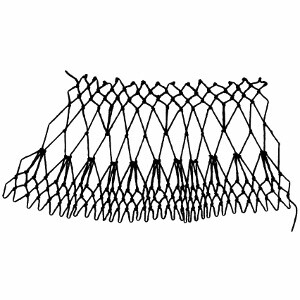 For circular netting, always net 1 less knot into the CK than into the other loops.